Because fire is one of the most dangerous threats to an aircraft, the potential fire zones of modern multiengine aircraft are protected by a fixed fire protection system. A fire zone is an area, or region, of an aircraft designed by the manufacturer to require fire detection and/or fire extinguishing equipment and a high degree of inherent fire resistance. The term “fixed” describes a permanently installed system in contrast to any type of portable fire extinguishing equipment, such as a hand-held Halon or water fire extinguisher. 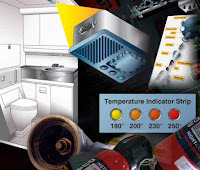 A complete fire protection system on modern aircraft, and on many older aircraft, includes a fire detection system and a fire extinguishing system. In addition to these methods, other types of detectors are used in aircraft fire protection systems but are seldom used to detect engine fires. For example, smoke detectors are better suited to monitor areas where materials burn slowly or smolder, such as cargo and baggage compartments. Other types of detectors in this category include carbon monoxide detectors and chemical sampling equipment capable of detecting combustible mixtures that can lead to accumulations of explosive gases. The complete aircraft fire protection systems of most large turbine-engine aircraft incorporate several of these different detection methods. The types of detectors most commonly used for fast detection of fires are the rate-of-rise, optical sensor, pneumatic loop, and electric resistance systems. The following classes of fires that are likely to occur onboard aircraft. Class A—fires involving ordinary combustible materials, such as wood, cloth, paper, rubber, and plastics. Class B—fires involving flammable liquids, petroleum oils, greases, tars, oil-based paints, lacquers, solvents, alcohols, and flammable gases. Class C—fires involving energized electrical equipment in which the use of an extinguishing media that is electrically nonconductive is important. Class D—fires involving combustible metals, such as magnesium, titanium, zirconium, sodium, lithium, and potassium. No false warnings under any flight or ground condition. Rapid indication of a fire and accurate location of the fire. Accurate indication that a fire is out. Indication that a fire has re-ignited. Continuous indication for duration of a fire. Means for electrically testing the detector system from the aircraft cockpit. Resists damage from exposure to oil, water, vibration, extreme temperatures, or handling. Light in weight and easily adaptable to any mounting position. Circuitry that operates directly from the aircraft power system without inverters. Minimum electrical current requirements when not indicating a fire. Cockpit light that illuminates, indicating the location of the fire, and with an audible alarm system. A separate detector system for each engine. Aeronautics Guide -. Powered by Blogger.